The Karoo quick dry plain t-shirt is pretty and feminine, whilst being extremely practical, making it the perfect choice this season. The Karoo feels cool and comfortable all day long, thanks to the little bit of stretch we've added to the fabric. Don't forget to pack your Karoo quick dry plain t-shirt on your next adventure, you'll be glad you did! Good quality, nice material. 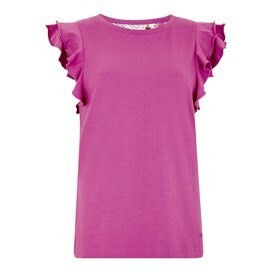 the frills are quite big however it is a bit different from a normal t shirt. Perfect fit. Really good quality. Lovely material,good fit, Love the frills on the sleeve edge. Great fit and colour to match Weirdfish skirt. Lovely soft fabric and true fit. The frilly sleeves are a bit big and floppy but overall nice top.